I went for a 60 km bike ride yesterday. Maybe you're snickering because you went for a 200 km ride this past weekend, but 60 km was an important milestone for me. It was the longest ride of my life. You don't just hop on your bike one day and decide to ride 60 km. You start small and gradually and safely increase your distances. Last summer, for example, my typical ride was about 10.5 km. Here's what my August 2013 looked like. 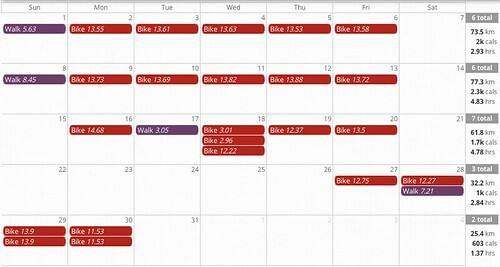 By December 2013, my typical ride was only 3 km longer. 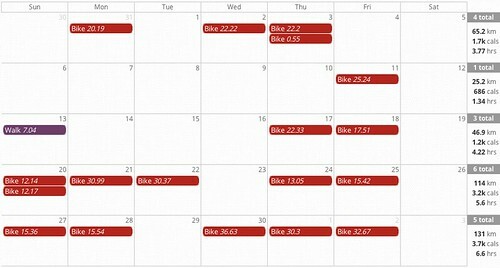 Not a single ride that month hit 15 km. Note the time I had to stay off my bike due to the ice storm. I tried to bike every week of this winter, but sometimes it was simply too cold or too dangerous. 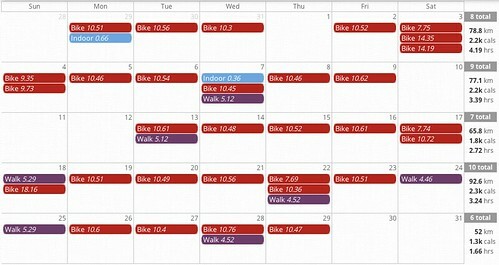 This was a rough winter for biking. This was my March 2014. 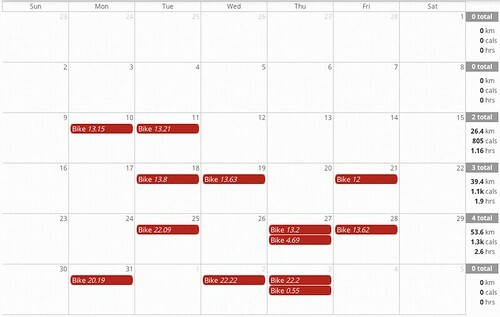 By the end of the month, I was up to 22 km rides. I had to take some time off for the birth of my son and while he was in Sick Kids hospital, but by the end of April 2014 I was regularly biking 30 km. My longest ride at the time was 36.63 km on the last day of the month. And that brings us to yesterday's 60 km ride. With the 36 km ride on April 30 I planned to ride 40 km during the first week of May, 50 km in the second week and 60 km in this third week. That's exactly what I did. Last summer, 13 km was a "long ride" for me. Today, 25 km feels like a "short ride". If you haven't been biking lately, get out there for a 5 km cruise. You don't start at 60 km, but with gradual and sensible increases, anyone can get there. Planning on 60km this weekend, then it's the 75 KM Ride for Heart the following one. Do you take snacks with you on your longer rides? I didn't but regretted it at the 50 km mark. Next time I'm going more than 50 km, I'm bringing snacks and water. You guys are machines - looking forward to hearing about both races once they've been completed. Very impressive! 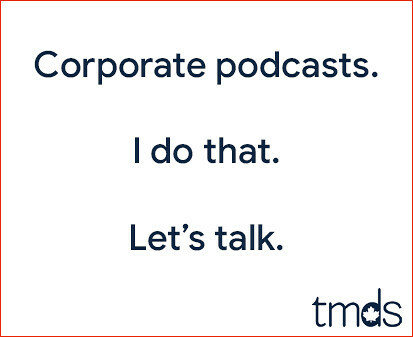 I've been watching my husband go through a similar training progression as he prepares to leave on June 4th to participate in the Wounded Warrior Canada fundraising Battlefield Bike Ride. The group of about 130 will travel to all the major Canadian battlefield sites in France ending at Vimy Ridge. You should all be proud of your efforts!